Finally, a great tasting way to get Omega-3! L’il Critters™ Omega-3 DHA Gummy Fish offers a healthy, convenient and delicious way for kids to supplement their diet with omega-3 fatty acids. 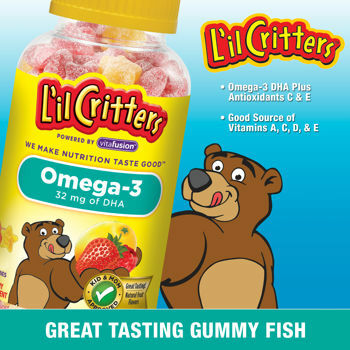 L’il Critters™ Omega-3 DHA Gummy Fish does not use FD&C Red #40, Blue #1, or Yellow #6. Omega-3 fatty acids are considered essential fatty acids. They are necessary for human health but the body can't make them, so you have to get them through food or supplementation. ‡Contains 32mg of DHA per serving, which is 20% of the 160mg Daily Value for DHA. Suggested Use: As a dietary supplement, parents may give each child up to two (2) gummies per day. Instruct child to chew each gummy carefully and thoroughly. This product uses high quality, purified fish oil that has been tested for mercury and PCBs. Take only as directed. Do not exceed suggested dosage. If your child has a medical condition, or is on medication, please consult a physician before using this product. Not recommended for children under 2 years of age due to choking. Do not use if inner seal is broken or missing. This product may settle during shipping. Product can be stored at room temperature, best if refrigerated after opening. Colors will darken over time. This does not alter the potency of the product. Keep out of the reach of children.